Since 1975, the U.S. National Indoor Tennis Championships have brought the sport's brightest stars to Memphis including Connors, McEnroe, Agassi, Sampras and Roddick, to Evert, Navratilova, Capriati, Davenport and Sharapova. They have consistently voted this tournament as one of their favorites on tour, and they come back year after year because of the superb playing conditions, atmosphere and southern hospitality that are all a part of this world-class gathering of athletes, sponsors and fans. 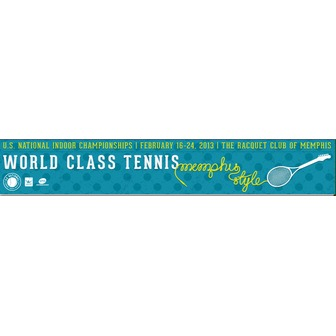 The ATP men's event in Memphis is 1 of only 11 cities in the world to own the prestigious 500 level men's event. The WTA International Memphis women's event hosts top players from around the world. The venue includes three indoor tennis courts. The main stadium court has assigned seats while the two grand stand courts are general admission seating. One tickets gets you access to all the courts. All evening matches and Friday - Sunday (2/22-2/24) matches are played on the stadium court. Main Draw Matches are February 18 - February 24, 2013. First round matches start on Monday, February 18 at 10:00am. A Daytime session ticket will get you access to see multiple men's and women's matches (singles and doubles) played from 10:00am until approx. 5:00pm. An evening session ticket will allow you to see two matches played starting at 7:00pm on the Morgan Keegan Stadium Court. Qualifying Rounds are February 16-17 - Matches start at 10:00 am and usually last until 3:00 pm.